A modified version of the GMA B caliper family is designed with the custom builder in mind. This is not a direct bolt-on kit. Removal of the original factory brake mounting tabs may be required. Converts OEM drum brake front end to 10" dual discs. Bolt-on dual disc kit mounts to original fender mounts. All mounting hardware and brackets are included. 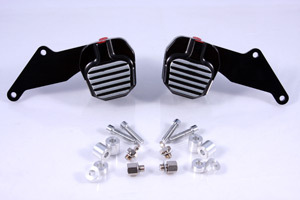 Kit includes aluminum spacers for mounting either the narrow, custom after-market fender or the OEM 16" fender. 16" or 19" wheels only. The kit requires 3/4" bore master cylinder.